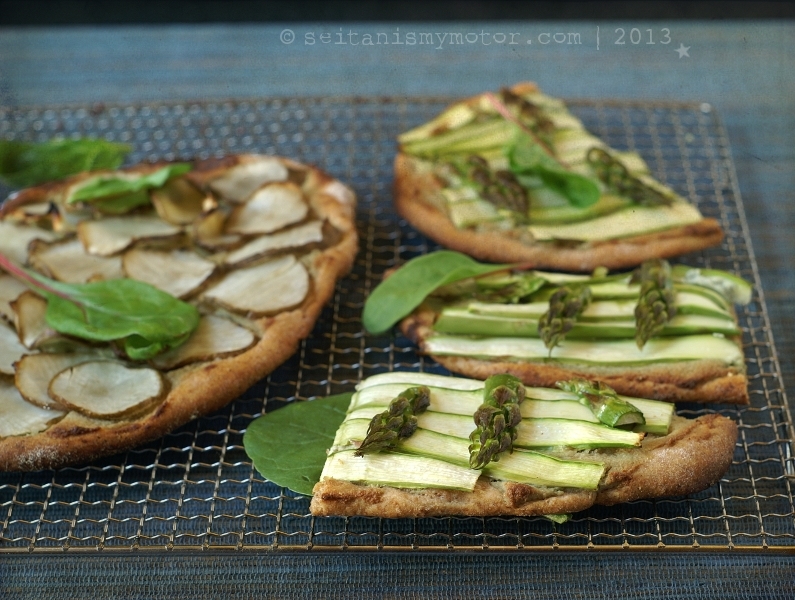 When I was browsing the internet yesterday, I cam across a post on shaved asparagus pizza. I never heard about it before, but apparently people have been blogging about it for a couple of seasons already. (For example here and here.) This kind of pizza is super easy to make and it sounded like a perfect dinner to me on a very warm spring evening. 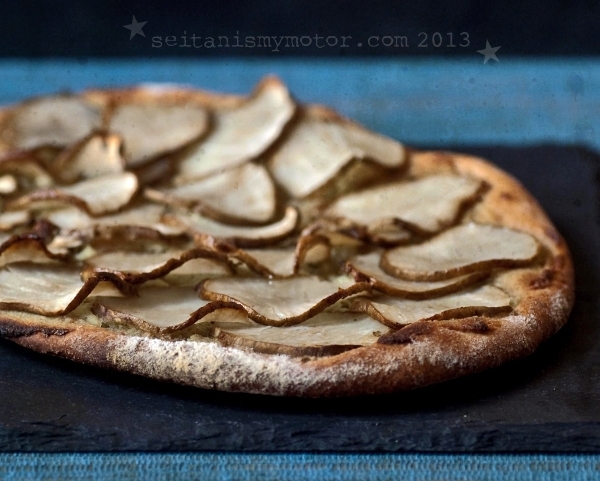 When I went to pick up the ingredients, I also grabbed some jerusalem artichokes, so I could make some shaved jerusalem artichoke pizza as well. I made 6 mini pizzas and divided the spread between them. Per pizza I used 2 stalks of asparagus, sliced with a mandoline slicer or one large jerusalem artichoke, also sliced with a mandoline slicer. Note: For a gluten-free pizza crust, click here. Add olive oil, garlic powder, and salt. Stir until combined and then knead for about 5-7 minutes. Cover the bowl and let the dough rest until doubled in size (about an hour). Meanwhile make the spread: Combine all ingredients in a food processor and purée until smooth. Set aside. Preheat the oven to 200°C (400°F). Line a baking sheet with parchment paper. Flour your working surface. Divide the dough into six pieces and roll into rounds or ovals. 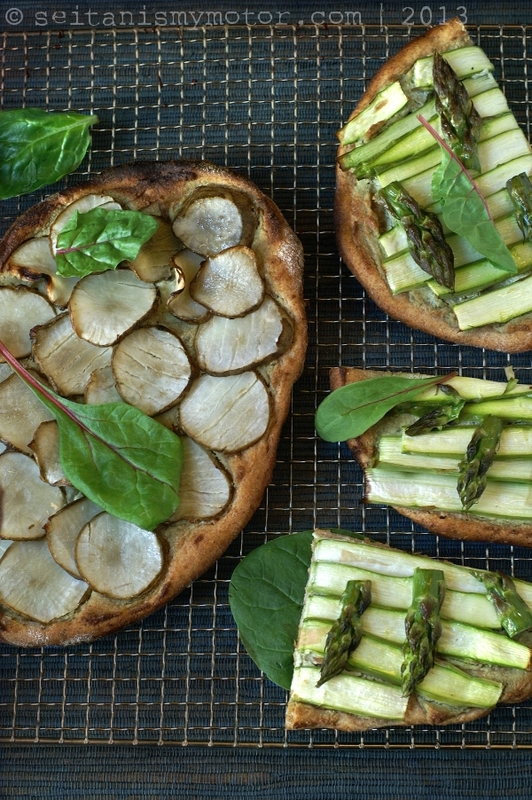 Divide the spread between the pizzas and top with asparagus and jerusalem artichoke slices. Brush with olive oil and season with salt and pepper. Place two pizzas on a baking sheet and bake for 12-15 minutes or until the crust is golden brown. Repeat with the remaining pizzas.